The United States Congress designated the Dead Mountains Wilderness (map) in 1994 and it now has a total of 47,158 acres. All of this wilderness is located in California and is managed by the Bureau of Land Management. This area encompasses the jagged, steep, rust-colored Dead Mountains and the alluvial fans sweeping to the west towards Piute Valley and east towards the Colorado River. Centered in the northern half of the wilderness is its highest point, Mount Manchester at an elevation of 3,598 feet. Picture Canyon (a spring location and major wash) transects the wilderness in the north and Piute Wash borders the wilderness on the west. Vegetation is predominantly creosote bush desert scrub and desert wash scrub. 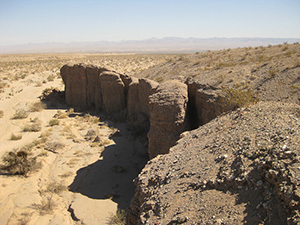 The northern most occurrence of smoketrees in the California Desert Conservation Area (CDCA) is found within the area's washes. Wildlife is typical for the Mojave Desert; including a small herd of bighorn sheep, coyote, black-tailed jackrabbits, ground squirrels, kangaroo rats, roadrunners, chucker, quail, prairie falcons, red-tailed hawks, golden eagles, rattlesnakes, and several species of lizards. The eastern and northeastern portions of the wilderness provide critical habitat for the threatened desert tortoise. Planning to Visit the Dead Mountains Wilderness? How to follow the seven standard Leave No Trace principles differs in different parts of the country (desert vs. Rocky Mountains). Click on any of the principles listed below to learn more about how they apply in the Dead Mountains Wilderness.